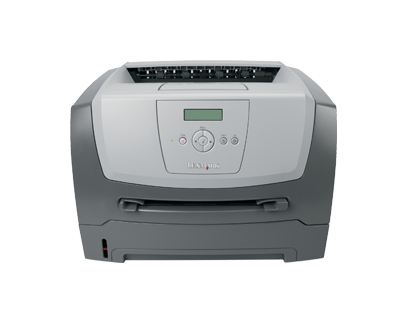 Lexmark's E352dn mono laser offers fast output up to 35 ppm (33 ppm A4), integrated duplex printing and Eco-Mode and Quiet mode for optimal energy efficiency and minimal noise. Leading technology makes the Lexmark E352dn one of the most energy-efficient printers in its speed range. Additionally, you can take advantage of integrated duplex printing to save paper and reduce user intervention. And the new Quiet Mode lets you diminish the already-low noise level to as little as 48dBA while printing. All in all, you save money, time and energy. Backed by a powerful 366MHz processor and 32MB of standard memory, the Lexmark E352dn makes light work out of your most complex print jobs. With rapid print speeds, a new instant-warm-up fuser and as fast as 6.5 seconds to first printed page, it's among the fastest in its price range. So now you can finish off documents before other printers even get started!